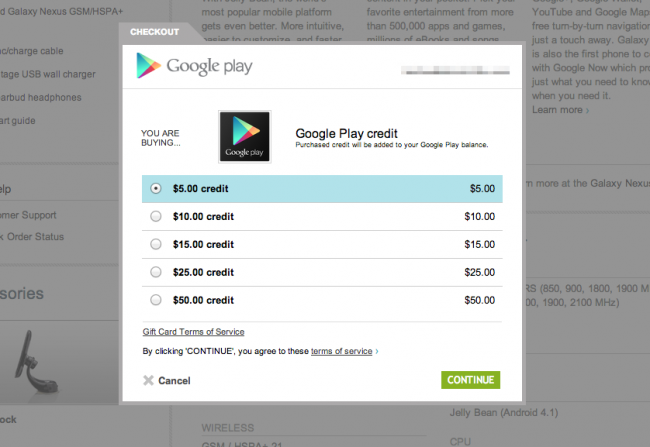 Struggling to find Google Play gift cards? Yeah, me too. I know they are supposed to be available at Target and Gamestop, but I have yet to see one in the wild here in Oregon. Maybe I’m just not looking hard enough. Thankfully, I no longer have to look if I don’t want to, because Google is allowing you to buy Google Play credit directly from the Play store. Problem half-solved! Unfortunately, until they allow me to buy Google credit and hand it to another user, this is sort of a meaningless move. If you are interested in loading up a child or friend’s account, know that you can buy anywhere from $5 to $50 worth of Play store credit.